The CPU cooling market has seen a shift lately with a greater focus on closed-loop water cooling solutions. 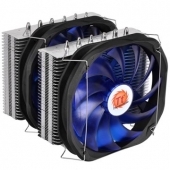 Despite this, your standard air coolers are still widely used and new ones are constantly being released. Prices on the water coolers are dropping though and the air coolers must try harder than ever in order to keep their performance numbers competitive. The issue is that air coolers can only go so far and they are approaching that limit fairly rapidly. Today we are taking a look at the Thermaltake Frio Extreme air cooler, which is teetering just on the brink of that limit. The Frio Extreme is one of the largest and heaviest coolers on the market, coming in at a whopping 1,230 grams. Read on the see if this massive brick of aluminum, copper, and plastic will actually translate into a quality cooler.